Emily “Toby” Farmer was born July 2, 1925, to B.J. and Gertrude Bybee and passed away on June 27, 2018. Toby grew up in El Dorado Springs, Missouri and graduated from El Dorado High School in 1943. She regularly attended the annual El Dorado Springs’ picnics and class reunions. Toby worked at JC Penney’s in the Catalog Department for 19 years. Toby was a member of St. Luke’s United Methodist Church for 53 years. 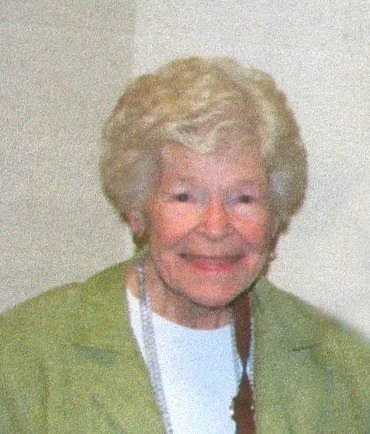 She was active in the Wesley Sunday School class and the United Methodist Women. Her greatest joy was being a grandma to her three grandchildren. She was preceded in death by her husband of 61 years, Frank Farmer; her parents, B.J. and Gertrude Bybee; two brothers, Clayton and Gene Bybee; and two sons, Kevin and Daryl Farmer. Survivors include her son, Jerry Farmer; her daughter and son-in-law, Patricia and Gary Nigh; and three grandchildren: Kyle, Bart and Leah Nigh. Funeral services will begin at 10:30am on Monday, July 2, 2018 at St. Luke’s United Methodist Church located at 9420 James A. Reed Rd., Kansas City, MO. Visitation will begin one hour prior to the funeral service at 9:30am. Burial will be at Green Lawn Cemetery under the direction of Park Lawn Funeral Home. The family requests contributions be directed to the St. Luke’s United Methodist Church in lieu of flowers. Visitation will begin at 9:30am at the church. Burial will follow at Green Lawn Cemetery. In lieu of flowers, memorial tributes may be directed to the church.